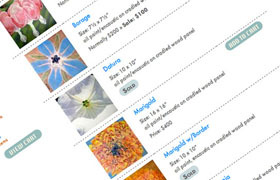 For artist Kate Cartwright, we display her art in a database-driven art gallery that doubles as an eCommerce site. Thumbnail-sized images enlarge to give visitors the opportunity to see the detail in each piece. A side column in the gallery provides ample page space for the artist to discuss her work and the many locations around New Mexico that inspire it.